In this article, we have compiled for you the legal situation for drone pilots in Israel. For the membership, a fee of 100 shekels (about 23 euros) is due, which you can pay via PayPal. When using drones in Israel, the following regulations should be observed. Maximum altitude: The maximum permitted altitude for drones in Israel is 50 meters. Maximum horizontal distance and FPV: Your drone must always be within the direct line of sight. Compulsory insurance: Your private drone flights are insured by your membership in the model airline within Israel. However, commercial pilots need their own drone insurance, which is valid in Israel. Maximum take-off weight (MTOW): No information available. Distance to airports: Airfields must always be at a distance of 2 kilometres. Other safety distances: You must maintain a distance of at least 250 meters to persons and buildings. No-fly zones: No-fly zones can be viewed on this map. You should avoid the old city in Jerusalem with a copter. Operating times: So far no restrictions known. Commercial pilot regulations: Commercial users must be licensed to fly drone flights from the CAA. 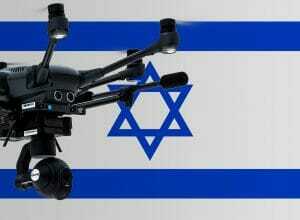 We have researched the listed drone regulations for Israel to the best of our knowledge. We can not guarantee the correctness of the information. If you want to be on the safe side, please contact the competent aviation authority. Alternatively, you can also ask the embassy in your country for further information about the regulations. Please leave us a comment when you receive news and/or gain experience with your copter in Israel! Appreciate for your sharing. I will be going to a Holy Land (Israel) tour with my church group. I am thinking of bringing along a DJI Spark (per specs weighs 300g), but not too sure if that can be brought in without an import permit; theoretically should not need as it is not greater than 300g. Your thoughts? Darren – you took a spark? Everything was fine? Please give more idea about the Spark in Israel, I’m going this week & would like to bring a Ph4p, but would prefer a smaller one. I checked with the Israeli consulate here in HKG, they don’t know a thing !! If we have world covering insurance (with the exception of USA) are we still required to join the FAI? Also, I have read that operating times are daylight only due to the line of sight requirement. I think it is better to have the membership even if you have insurance. Your blog was helpful for me to fly my drone in Israel. I got a temporary membership by sending an email as you mentioned in your blog. It was a good experience for me to fly drone in Israel.